Every day in December, I'm writing a short post about some food memory from 2011, mostly to be more thankful for all the great food and drink I've been lucky enough to have this year. Summer makes me happy. Taking advantage of what summer has to offer makes me happier. There's a big park near where I live that overlooks the Manhattan skyline. Two huge bridges, the Hell's Gate Bridge and the RFK Bridge (formerly the Triboro) demarcate either side of the park. Between them are an enormous outdoor pool, walking paths, and a expansive lawn for picnicking. I make the most of that park all summer long with dinners and lunches on the lawn. I couldn't be more thankful to have it, a grassy haven in a concrete-and-apartment-building kind of city. 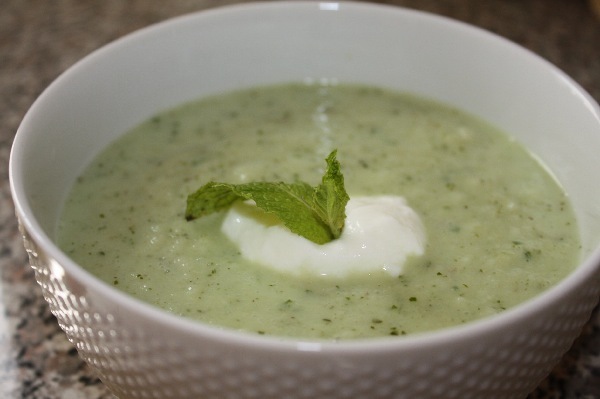 I'll pack all kinds of crazy picnics to take to the park during the summer, but for the truly hottest days, it's best to think light: see my recipe for chilled cucumber and yogurt soup. Pop it into a thermos or tightly sealed jar, grab a couple of spoons and a loaf of crusty bread from the deli, and you're set.